I’m not great about clipping coupons from magazines and newspapers, but I have gotten much better at using electronic coupons and coupons I can browse and print online. One new place that I was introduced to this week was Step Up, Save & Live Happy for the Chattem brand of products. Right now they are running coupons and up to $10 in rebates electronically but only if you buy before March 18, 2017! If you ask me, these are some of the things that I hate spending money on the most but are essential products to have in the medicine cabinet. If I can save a little bit of money on them, I’m going to do it however I can. Their rebate program is super easy because you just buy the products, take a picture of your receipt, and then get your rebate via PayPal. 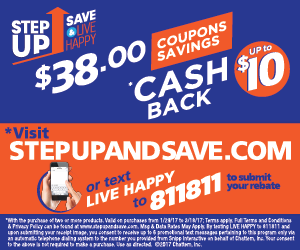 Visit StepUpAndSave.com now to get easy access to the coupons and the cash rebates!